Louisville is a relatively slow course (probably because of the heat) with a course rating of 2:53 (but quite some variation). Last year’s winners were Chris McDonald in 8:27 and Nina Kraft in 9:38. The course records are 08:25:27 by Victor Zyemtsev and 09:20:21 by Nina Kraft, both from 2009. 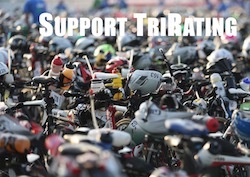 This year, it is a 1.000 points race, so I don’t expect any Kona contenders to race this race. Other than these two, no athlete has a reasonable (statistical) chance of winning the race.